Two of my baby brothers have Duchenne muscular dystrophy, my mother is a carrier. My question is if I am a carrier would I get symptoms as I age? And what are the chances of me being a carrier? These are great questions! There is a 50% chance that you are a carrier for Duchenne muscular dystrophy (DMD), just like your mother. Typically, carriers for DMD do not have any problems. But 20% of DMD carriers do have some symptoms, though not as severe as someone with the full disease. Let’s take a step back and think about what causes Duchenne muscular dystrophy, as this will help explain what it means to be a carrier. Duchenne muscular dystrophy is caused by a change in a gene called DMD. This is where the wording can get confusing! “DMD” is both the name of the gene that causes Duchenne muscular dystrophy and a shortened way to say, “Duchenne muscular dystrophy”. The DMD gene makes an important muscle protein, called Dystrophin. If the DMD gene is mutated, it can’t make the Dystrophin protein. Without Dystrophin, the muscles will get weaker and weaker over time. This causes the symptoms that you see in patients with muscular dystrophy. As long as you have one working version of the DMD gene, your muscles will have enough dystrophin to work. This makes muscular dystrophy a recessive disease. More specifically, DMD is an X-linked recessive disease. This means the DMD gene is located on the X chromosome. Girls have two X chromosomes: one from Mom and one from Dad. This means they have two copies of the DMD gene. And since muscular dystrophy is recessive, as long as the girl has at least one working version of the gene she will be fine. But boys only have one X chromosome, inherited from Mom. (They inherit a Y chromosome from Dad!) This means that boys only have one copy of the DMD gene. If a boy inherits a broken version, there won’t be a good version to compensate. He’ll develop muscular dystrophy. 1 in every 5000 baby boys will have DMD. Symptoms start to appear when they are between 16 months and 8 years old. Some early symptoms might include not walking as soon as other babies, not standing up when other babies typically stand, walking with a waddle, trouble going up stairs, or difficulty running and jumping. Because muscles of children with DMD get weaker over time, eventually these children will start using a wheelchair. Boys who have DMD tend to live shorter lives than the average person. Boys who inherit one broken DMD gene will develop muscular dystrophy, while girls who inherit one broken gene will be carriers. What does it mean to be a carrier of DMD? 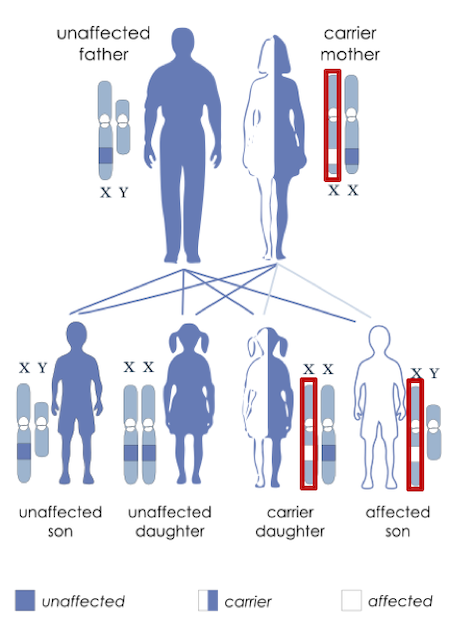 A woman who is a carrier has one normal version of the DMD gene and one broken version of the DMD gene. She doesn’t have Duchenne Muscular Dystrophy herself, but she carries the DNA for it and can pass that DNA on to her children. Since your mom is a carrier, she could have passed either X chromosome to you: the one with the broken DMD gene or the one with the working DMD gene. Since it’s random which one she passed on, you have a 50:50 chance of being a carrier. Around 20% of carriers will have a condition that makes it harder for the heart to pump blood, called cardiomyopathy. This usually starts to show up as an adult. Less than 8% of carriers develop muscle symptoms, usually before the age of 15. This may include problems with walking and muscle weakness. Between 2 – 20% of carriers develop both these heart and muscle symptoms. Generally speaking, more research needs to be done to better understand how best to take care of carriers of Duchenne muscular dystrophy. If you have any more questions, it’s always a good idea to talk to your doctor or a genetic counselor. I am sure they would be happy to help! The National Organization for Rare Disorders (NORD) and the Muscular Dystrophy Association are great resources for learning more about Duchenne muscular dystrophy. Ishizaki et al., "Female dystrophinopathy: Review of current literature." Neuromuscular Disorders. Viggiano et al., "Determining the role of skewed X-chromosome inactivation in developing muscle symptoms in carriers of Duchenne muscular dystrophy." Human genetics. Stark. "Determinants of the incidence of Duchenne muscular dystrophy." Annals of translational medicine.